Fixed Mount VHF Radio with AIS and GPS! 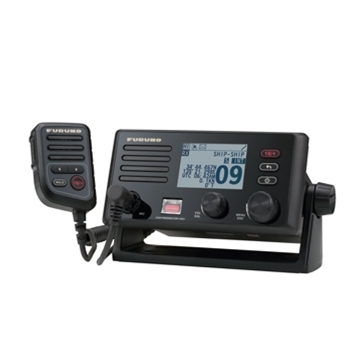 The Furuno FM4800 is a commercial grade 25 W VHF with an integrated AIS receiver. Its compact housing enables it to be installed in a variety of vessels, even boats where space is limited, such as center-console boats. Ease of operation is one of the great design features of this fixed mount radio by utilizing the sleek rotary dial. With its built-in 72 Channel GPS receiver, the FM4800 does not require an external GPS to enable its DSC function. The unit can be used as a backup source of GPS positioning for other electronics onboard your vessel. NMEA0183 and NMEA2000 connectivity make the FM4800 very easy to network with an array of different devices. The internal AIS Receiver can be used to display and overlay AIS targets when networked with GPS Plotters or MFD's, such as NavNet TZTouch, TZTouch 2 , or GP 1871F/GP 1971F combination units and the FM4800 is able to act as a 15W PA/ loud hailer with intercom which features 8 different alert sounds. The listen back feature provides extremely clear 2 way communication on board and with Dual Station Capability - The optional HS-4800 Handset supports complete functionality of the FM-4800 VHF and acts as a second station setup. If you’re looking for an all-in-one VHF that’s easy on the eyes and wallet, the Furuno FM4800 is the VHF/AIS Receiver that you’ve been waiting on!